Speed and ruggedness are not really a good match. But that is where the challenge lies. Jeep safari is about zooming the wheels through the craggiest landscape. In India it means a long stretched journey through the undulating terrain - lonesome, weathered and infested with thick forests. 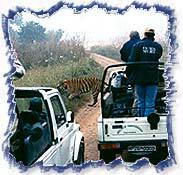 However, lately Jeep safaris have become synonymous with wildlife safari tours where the four wheels meander through the jungles trekking wild animals. A grand, long sweep through the length and breadth of India can be an exorbitant experience. Top Travels and Tours have just the kind for the brave-hearts. Winding routes, cut out on steep hills for travel, with deep gorges where, if you have time to stop and listen minutely, you will hear the soft gurgle of some stream that snakes through it. And you pass some roadside dhabas (local restaurants), the sumptuous fragrance of tandoori chicken will arrest you into a screeching halt. Or there are the endless sterile expanse of the Thar where your journey at times transforms into a quest for an oasis. Nothing can be a better option to explore the varied Geo-morphology, clusters of tribal villages, ruins of ancient architecture - that India stands for. Himalayan regions like Leh, Ladakh, Kinnaur, Spiti, Manali, Kumaon and Garhwal have abundance of such safari expeditions. Rajasthan's arid deserts are also favorite haunt of jeep safari fans. And of course, the plethora of wildlife sanctuaries and national parks have jeep safaris ideal for wildlife photographers and naturalists. Car lovers can head for the Jaipur Car Rally held every January which has the best vintage cars competing against one another. The 1903 Humber, 1919 Fiat, 1923 Rover, 1936 Mercedes Benz 170V, 1938 Moms 8, 1923 Austin and the 1926 Erskine are some of the species you can toast your eyes with over here. A pleasure ride can also be arranged.